WASHINGTON — Feb. 10, 2004 — High school graduates must master more English and math for their diplomas to signify readiness for jobs and college, says the American Diploma Project (ADP), which today released new graduation benchmarks. As states raise high school graduation requirements to link them more closely to the demands that graduates face, colleges and employers must reward graduates who meet those requirements. The three ADP sponsors — Achieve, Inc.; The Education Trust and the Thomas B. Fordham Foundation — call upon higher education, employers and policymakers to tie admissions, placement and hiring decisions to solid new 12th grade high school exit standards. "No state can now claim that every student who earns a high school diploma is prepared academically for postsecondary education and work. 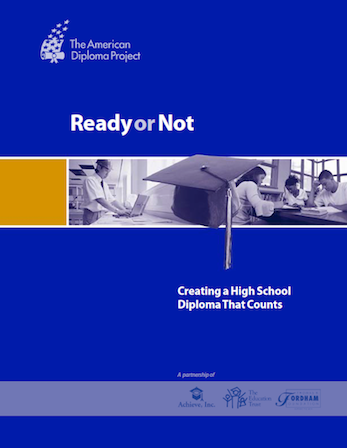 The policy tools necessary to change this do in fact exist — but they are not being used effectively," the American Diploma Project contends in Ready or Not: Creating a High School Diploma that Counts. The full report is available at www.achieve.org. Based on both statistical analysis of employment data and extensive research involving more than 300 faculty members from two- and four-year postsecondary institutions, front-line managers, and high school educators, the ADP benchmarks concretely define the English and math that graduates must master to succeed in credit-bearing college courses and high-performance, high-growth jobs. Its key findings: employers' and colleges' academic demands for high school graduates have converged, yet states' current high-school exit expectations fall well short of those demands. The two-year American Diploma Project was funded by a $2.4 million grant from the William and Flora Hewlett Foundation. ADP enlisted five states — Indiana, Kentucky, Massachusetts, Nevada and Texas — as research partners and pioneers in carrying out key elements of the ADP policy agenda. The ADP benchmarks come at a critical moment, as educators and philanthropists focus new attention on the American high school and as states are challenged to raise student achievement to the "proficient" level demanded by the No Child Left Behind Act. "Boosting the number of students who are called proficient without ensuring they also are prepared for their futures is a hollow exercise," said Achieve President Michael Cohen. "Students and their parents deserve better. With the ADP benchmarks and recommendations in hand, states can set the right standards and put students on pathways to success." Once an entry pass into a productive adult life, today's high school diploma represents a broken promise: earning one no longer guarantees that a graduate is ready to compete after high school, either in the college classroom or the modern workplace. At least 28 percent of students entering two- and four-year colleges immediately need remedial English or math, and more than half will take at least one remedial course before graduating. Yet students taking even a single remedial course are 20 percent less likely to earn a bachelor's degree. While 70+ percent of high school students enter college, most never complete a degree. Students' preparation in high school is the best predictor of whether they'll end up with a bachelor's degree. The degree-attainment gap between white and minority students shrinks by half when all have taken similarly rigorous courses in high school. More than 60 percent of employers rate high-school graduates' skills in basic English and math as fair or poor; one study estimates the cost to a single state's employers for remedial training at nearly $40 million a year. Many states have sought to boost their graduation expectations by raising course requirements and giving exit exams. Yet such efforts seldom take full account of the intellectual challenges that graduates face in college courses and in jobs that can keep families out of poverty. Exit exams often measure 8th or 9th-grade content and courses bearing the same names can reflect widely differing expectations. "People who grouse about high-school exit tests are voicing the wrong objection," said Fordham Foundation President Chester E. Finn, Jr. "What should spark real dismay is the gap between what states expect of graduates and what the real world demands for their success." Achieve, Education Trust and Fordham launched ADP to help states restore the diploma's value by anchoring high school graduation standards to those of jobs and colleges. Toward that end, ADP has moved beyond the kinds of standards that reflect experts' consensus view of what is desirable for students to learn, to expectations linked directly to the essential demands faced by students preparing for college, work and citizenship. The project found an unprecedented convergence between the knowledge and skills employers seek in new workers and those that college faculty expect of entering students. Both groups expect that high school graduates can complete a significant research report and apply the higher-level math concepts historically taught in Algebra II, for example. The ADP benchmarks are ambitious. In math, they reflect content from Algebra I and II, Geometry, Data Analysis and Statistics. In English, they demand strong communication skills, as well as the analytic and reasoning skills typically associated with today's advanced and honors classes. Whether interpreting an introductory economics text in a college classroom or communicating safety rules to a construction crew, high school graduates must master content and skills beyond those expected by present state standards. "When all kids get the same, rigorous high school curriculum, we know that poor and minority students can more than hold their own in college," said Education Trust Director Kati Haycock. "Through ADP, we now know just as definitively what it will take for graduates to compete in higher education and in good jobs, and it's intolerable we would offer them less and consign them to dead-end futures." Mobilizing employers and business leaders to insist that states align high school standards, assessments and graduation requirements with the demands of postsecondary education and work and show graduates that achievement matters by using high school transcripts and exit test results in making hiring decisions. Created by the nation's governors and business leaders, Achieve, Inc., (www.achieve.org) is a bipartisan, non-profit organization that helps states raise academic standards, improve assessments and strengthen accountability to prepare all young people for postsecondary education, work and citizenship. Achieve has helped nearly half the states benchmark their standards and tests against the best examples in this country and abroad and work in partnership to improve teaching and learning. Achieve serves as a significant national voice for quality in standards-based reform and regularly convenes governors, CEOs and other influential leaders at National Education Summits and other gatherings to sustain support for higher standards and achievement for all of America's schoolchildren. The Education Trust (www.edtrust.org) works for the high academic achievement of all students at all levels, kindergarten through college. The organization focuses its work on the institutions most often left behind in initiatives to improve education — those serving concentrations of low-income, Latino, African American or Native American students. The trust was established in 1990 by the American Association for Higher Education as a special project to encourage colleges and universities to support K–12 reform. Since then, it has grown into an independent, non-profit organization whose mission is to help schools and colleges work for all of the students they serve. The trust staff spends most of its time providing assistance to local, state and national leaders in developing both policies and improvement strategies to raise achievement and close gaps between groups, K–16. The Thomas B. Fordham Foundation (www.edexcellence.net) supports research, publications and action projects of national significance in elementary/secondary education reform, as well as directs programs in the Dayton, Ohio area. Its focus is on higher education standards, accountability, equality of opportunity, educational diversity and competition, and capable teachers. The foundation is proactive, designing projects and seeking out suitable partners to further its missions of public awareness and education reform. The foundation's program seeks to make a difference in education not by adding resources to established organizations or supporting conventional ideas, but by seeking out well-conceived projects that go against the grain, challenge the conventional wisdom, alter the status quo and work outside the box.